Take a short trip east of the City of London to Wapping. From the Prospect of Whitby pub you will see one of my most favourite river views. Against the hangman’s scaffold and noose you’ll see the developing skyline of the modern Canary Wharf complex that has emerged from the former London Docklands. The Prospect of Whitby dates way back to the time of Henry VIII, with minimal utilitarian seating; flagstones paving the bar and an unusual long pewter counter that is supported by barrels. A meeting place for sailors from all over the globe for some four hundred years, the pub today is popular with its locals. It also receives international tourists, sometimes by the coach load. The old Devil's Tavern suffered severe damage from a disastrous fire which swept through maritime Wapping in 1682. 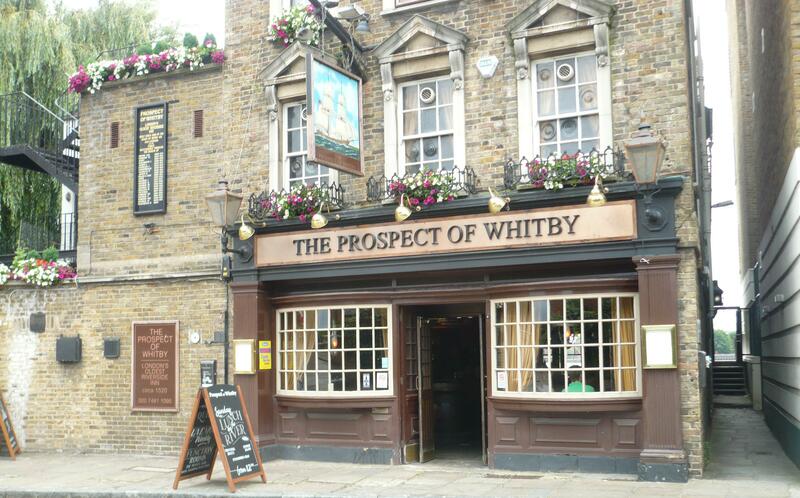 The landlord changed its name to the `The Prospect of Whitby' in 1777, in honour of a collier boat from Whitby, Yorkshire called 'the Prospect'. This was one of the collier boats which brought coal down from Newcastle to the Wapping Hydraulic Power Station, just north of the pub. Towards the end of the 16th Century, Britain had become an increasingly successful trading nation with overseas ships entering and leaving London on a steady basis. Boats had to berth mid-stream and were dependent upon lighters, flat bottomed boats piloted by lighter men, to transport goods from ship to quayside. The opportunities for pilfering and other nefarious activities were immense, the Devil's Tavern was a haunt where many a plan was hatched and many a deal made between smugglers and river thieves. One customer, this side of the law but no less a devil, was the Hanging Judge. The notoriously cruel Judge Jeffreys of `Bloody Assizes' fame would often watch the execution of felons and pirates whom he had sentenced to hang. Such a gruesome feature of London life was regarded as a holiday attraction and crowds would flock to the Tavern on these occasions. The villains would be hung and then pinned to the river wall on low tide, and remain there until three tides had covered their bodies. One of the most notable executions was that of the privateer Captain Kidd on 23 May 1701. The noose hanging you see in the picture reminds us of this period in our history. Samuel Pepys, the Diarist and as Secretary to the Admiralty during the reign of Charles II, would visit the Tavern when on naval business, looking particularly into cases of mutiny. The room he used to dine in is today called `Ye Pepys Room'. Another client of the pub was John Westcombe who, in 1780, sold a flower to a local market gardener for a noggin of rum. John had recently returned from Japan and the market gardener, a Mr. Lea, grew 300 cuttings from the plant that became known as the fuchsia. Writers and artists witnessed first hand the colourful scene at the Prospect of Whitby. Charles Dickens would make notes while sitting on the high settee on the wooden balcony in `Ye Pepys Room'. The Prospect was well known to Dr. Samuel Johnson, the author of the first English dictionary and the landscape painter, Joseph Turner who stayed there under an assumed name. Gustave Dore, the French painter would sit on the veranda or Pelican Stairs and sketch the riverside scene and the American painter Whistler was also a patron. From the small balcony where this photograph was taken, you can sit above the river and listen to the rhythmic lapping of the water. Up the creaking stairs inside, there is a restaurant and a very pleasant terrace with tables. This is a very popular pub, so go early if you want to enjoy it fully.